SELLER INVITING ANY REASONABLE OFFERS! Designed by Scott Kaufmann, Tabasco is an exceptional performance cruising yachtthat isintended for short-handed sailingand hasshoal draft capabilities, so you'll never be limited by lack of crew or depth. Tabasco has been maintained professionally in top condition since new; she recently spent the winter at Front Street Shipyard in Maine to get a new generator, A/C units, bottom paintwith epoxy barrier coat, and much more. Tabasco has been actively cruised, proving her abilities crossing oceans and functioning as a self-sustained cruising home in many of the most exotic places in the world. 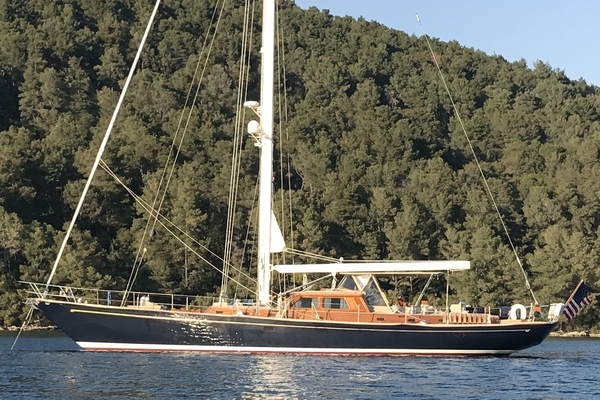 Sheis considered one of the finest sailing yachts available on the market today. United Yacht Sales New Jersey would love to guide you through a personal showing of this 76' Baltic Custom 76 Cutter 1986. This yacht for sale is located in Unknown, Florida and priced at $995,000. For a showing please contact us by filling out the form on this page and we will get back to you shortly! TABASCO is a true world-class cruiser. She was designed and built by an extremely experienced racing and cruising yachtsman to be the ultimate performance cruising platform. Her modern fiberglass hull form and powerful rig make her fast on all points of sail. The keel/centerboard configuration maximizes performance, yet gives her the gunk holing abilities of a much smaller yacht.On the main deck, there are two cockpits. Aft is the helm cockpit with a bimini; forward is the owner's cockpit, well set-up for dining or relaxing. This area leads down to the raised pilothouse. The interior is done beautifully in high gloss teak. There are teak and holly cabin soles throughout. Tobasco isa very warm and airy yacht.Below decks, the owner and guest staterooms are forward of the raised pilothouse. MASTER STATEROOMwith centerline queen is forward, with private ensuite head and stall shower to starboard.A complete entertainment center,including a flat-screen TV, is in the master. Also, there is a double hanging locker to starboard, and desk/vanity, clothes locker, and drawers to port. Moving aft down the hallway, a full-size SAUNA/SHOWERis to port. Regularly used as a large shower stall, switch on the heating element and enjoy.Athrwartships the sauna is the GUEST HEAD witha showerto starboard. Equipped with a sink vanity with mirror above and storage below. This head can be accessed throughout the starboard guest stateroom or the walkway. The port and starboard GUEST STATEROOMS each have a double berth, cupboards, and a hanging locker. All cabins have blackout screens installed, as well as reverse-cycle A/C.The Entry to port side of engine room is under the stairs up to the pilothouse.The RAISED PILOTHOUSEis ideal for viewing, dining, or relaxing, and large windows offer outstanding views. L-shaped settee, bookshelf, and entertainment center to port. Wet bar and TV to starboard. Forward isthe navigation station and aninside helm station. A large center hatchprovides access to the main engine room. Moving aft and down from the pilothouse is a hallway. To starboard is the CAPTAIN'S CABINwith upper and lower berths. AC and DC breaker panels are to port with washer underneath. Entry to the starboard side engine room is under the stairs to the aft hall. To port is a large and complete gourmet GALLEY.The galleyhas a huge counter space with all the amenities one would expect at home. Storage is plentiful and the fridge and freezer are commercial grade. Food can be easily passed up on deck from the galley so you can take full advantage ofa nice evening.Fridge and freezer cold plates run off 220V AC commercial compressor and/or engine-driven compressor. All the way aftis a large DINING SALONwith seating for eight. There are pilot berths above and outboard of the dining settee. An aft companionwayprovides access to the center cockpit. The galley is also accessible from the aft salon.